Happy Monday! What was the highlight of your weekend? Since I know some of you like to "go meatless" on Mondays, I figured I'd post this today. I recently made these to drop off to good friends for a ready-to-go meal during a time of need (hence the aluminum tin...sorry!). They were so delicious that I had to keep one for myself :) Feel free to add meat if you like...but you definitely don't miss it with this great combo of beans and veggies. These can be made ahead and transported easily, too. A great weeknight meal...especially on Meatless Monday! Preheat oven to 375 degrees. Heat oil in a skillet, then add onion and garlic. Saute for a few minutes, then add rice, corn and beans. Add all spices and mix. Cook until heated through, about 5 minutes. Place peppers in a baking pan and fill each half with rice mixture. Bake for 15 minutes. Remove from oven and add cheese on top. Return to oven and cook another 5 minutes, or until cheese is melted. Serve. 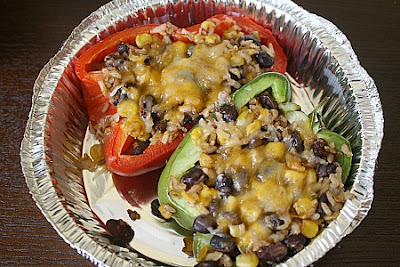 I love stuffed peppers, and I love that you made them meatless. They look so delicious and filling.